Be warned. When you first set out to make your own bread, you might not be aware of the possibility that it will become an obsession. Baking is an art form, and its infinite variations can start to eat into your spare time. If all you want to do is get a tasty loaf though, it's easy to stick to the basics. Assemble your ingredients. For a basic white loaf, you''ll need strong bread flour, a sachet of instant yeast, a little salt, water, and maybe some sugar. Measurements will depend on the size of loaf you require. For a substantial family loaf, mix about 600g of flour with the yeast, a tablespoon of salt and enough warm water to make a sticky dough. Adding a little sugar will help the yeast expand. Knead the dough for around ten minutes. Put a little olive oil on your hands to prevent sticking, but don't be tempted to make the dough drier. The moister the better for your finished loaf. Allow the dough to rise, until it has doubled in size. Then gently push and fold it back, and leave to rise again. Leaving the dough overnight will often improve the flavour and texture of the finished loaf. As with many home-made recipes, the slower processes often produce the most satisfying results. For a rustic loaf, put the dough on an oiled baking tray. A loaf tin will give a more regular shape. Bake at a high temperature, around 200-220C for 30 minutes. 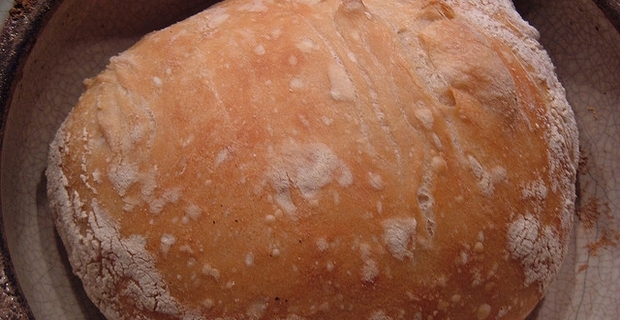 The loaf is cooked when the crust is golden brown, and the loaf sounds hollow when you tap the base.